Advances in gene transfer technology have greatly expanded the opportunities for developing immunotherapy strategies for breast carcinoma. Genetic immunotherapy approaches include the transfer of genes encoding cytokines and costimulatory molecules to modulate immune function, as well as genetic immunization strategies which rely on the delivery of cloned tumor antigens. Improved gene transfer vectors, coupled with a better understanding of the processes that are necessary to elicit an immune response and an expanding number of target breast tumor antigens, have led to renewed enthusiasm that effective immunotherapy may be achieved. It is likely that immunotherapeutic interventions will find their greatest clinical application as adjuvants to traditional first-line therapies, targeting micrometastatic disease and thereby reducing the risk of cancer recurrence. A central issue in the management of women with breast cancer is the prevention of metastatic disease. Although primary surgical treatment is generally effective at controlling local disease, many patients have micrometastases at the time of diagnosis. A substantial proportion of women diagnosed with breast cancer will have a subsequent recurrence of disease, and it is in these women in whom significant morbidity and mortality occurs. Adjuvant therapies with hormones or chemotherapy have resulted in a modest decrease in the relapse rate, but novel approaches are needed. A primary difficulty lies in defining a treatment that will effectively destroy disseminated tumor cells without significant toxicity to the patient. Immunotherapy attempts to achieve this goal by recruiting the host's immune system to identify and destroy aberrant tumor cells. Studies of the interaction of tumor cells with cells of the immune system has led to the development of novel, more rational strategies for immunotherapy. It has long been apparent that tumor cells exhibit some degree of immunogenicity, and attempts to enhance the immune response to tumor cells date back more than 90 years [1,2]. Cancer immunotherapy strategies are based on eliciting or augmenting a specific host immune response to tumor-associated antigens (TAAs) that are present on tumor cells. Such approaches are particularly aimed at enhancing the function of the cellular immune response, as it is believed that killing of tumor cells is primarily mediated through the action of T cells. There is considerable evidence that the immune system can recognize tumor cells by virtue of TAAs, and a limited immune response to many of these antigens is detectable in patients. Breast cancer patients exhibit both circulating antibodies and cytotoxic T lymphocytes (CTLs) that are specific for breast tumor antigens, including HER-2/neu (erbB-2) [3,4], MAGE-1 , and MUC-1 . In addition, both CD4+ and CD8+ T cells have been identified as components of breast tumor infiltrating lymphocytes . Despite these specific immune responses, tumor cells manage to evade detection and/or destruction. Recent advances in tumor immunology [8*] have provided a more complete understanding of the interaction of tumors with the immune system, and have delineated the diverse mechanisms by which tumor cells circumvent the immune response. Tumor cells themselves may exhibit altered properties as a means to avoid T-cell recognition. These can include downregulation of expression of specific antigens [9,10], or major histocompatibility complex (MHC) molecules [11,12]. Defects in the antigen-processing machinery, specifically the peptide transporter associated with antigen processing (TAP) molecules, may lead to an overall decrease in immunogenic peptides on the tumor cell surface . In breast cancer, downregulation of TAP expression with concurrent loss of human leukocyte antigen (HLA) class I expression is common in high-grade lesions [14*]. As an alternative mechanism, tumors may influence T-cell responsiveness by secreting immunosuppressive molecules such as interleukin (IL)-10 and transforming growth factor-β [15,16], or by directly killing Fas-positive infiltrating T cells through expression of the Fas ligand [17,18]. The interaction of Fas with Fas ligand induces apoptosis in the infiltrating lymphocytes. Finally, a common reason that T cells do not respond to tumors may be that TAAs are presented by antigen-presenting cells in such a way that anergy and tolerance is induced, rather than T-cell activation [19,20]. The importance of appropriate immunostimulatory molecules during antigen presentation has recently been appreciated. The long-standing immune surveillance theory holds that immune responsiveness is based on the recognition of self versus nonself , and that tolerance to self is established in the neonatal period. That theory has been challenged because it has become more apparent that the environment in which an antigen is presented is critical in determining the type and extent of immune response induced . The danger theory  suggests that it is the release of alarm signals, induced by cells experiencing stress, that promotes a potent immune response. Therefore, the presence of costimulatory molecules that activate T cells during antigen presentation is critical to the development of a robust immune response. Effective antigen-presenting cells express the costimulatory molecule B7 in conjunction with the antigen on the cell surface. This molecule also engages the T cell, providing the necessary signal to promote activation. The effectiveness of this response is modulated by the presence of cytokines, with stimulatory cytokines such as IL-12 enhancing T-cell response (Fig. 1). Without appropriate stimulatory signals, T cells encountering an antigen move to anergy or undergo apoptosis. This new understanding of the potential defects in the elicitation of tumor-specific immune response has led to the development of strategies that address these deficiencies. Furthermore, these observations suggest that it should be possible, with proper manipulation of the immune cells and the local cytokine milieu, to induce an immune response to both self and nonself molecules. As the processes required for autologous tumor rejection become better characterized, new strategies are being developed to potentiate the immunogenicity of tumor cells. A variety of strategies that rely on transfer of cloned genes have been developed to elicit or enhance host immune response to tumor cells. Transfer of genes that encode immunostimulatory molecules (cytokines and/or costimula-tory molecules) directly into tumor cells is one means to enhance their immunogenicity. Several cytokines have been evaluated by this approach. Initial studies focused on IL-2. Although it was shown to be effective in boosting antitumor immunity, IL-2 can be associated with unacceptable toxicity when delivered systemically . To overcome the toxicity of systemic delivery, direct ex vivo transduction of tumor cells with cytokine-encoding complementary DNAs has been explored in mouse models of mammary carcinoma [25,26]. After irradiation, transduced cells may be used as a vaccine, providing a scenario in which tumor antigens are available in an environment of locally high concentrations of the immunostimulatory molecules. The presence of this cytokine allows direct activation of CD8+ cytolytic T cells (CTLs), bypassing the need for CD4+ help . In addition to IL-2, a variety of other cytokines have been explored in this manner. Interferon-γ has pleiotropic effects, including upregulation of MHC molecules and the recruitment of cells of the immune system [28,29]. Granulocyte-macrophage colony-stimulating factor (GM-CSF)  and IL-12  have also shown efficacy in animal model studies. GM-CSF is notable because it promotes dendritic cell (DC) differentiation, and may thus mediate the most effective presentation of tumor antigens (see below). Some encouraging initial results have been reported using this cytokine in prostate cancer patients . IL-12 is also of interest because it particularly enhances the cellular arm of the immune system. To further increase the effectiveness of whole cell tumor vaccines, several groups have combined immunostimulatory genes for transduction of tumor cells. Transduction of tumor cells with different cytokines  or cytokines with the B7 costimulatory gene [34,35] has proved to be more effective than using a single cytokine alone. Genes that encode cytokines delivered in combination with a chemokine [36**] also enhance immune responses, presumably as a result of more efficient recruitment of relevant lymphocytes to the site. Augmentation of cytokine effectiveness may also be achieved by interfering with inhibitory signals delivered to T cells. This was accomplished by blocking the interaction of CTL-antigen-4 on T cells with B7 on the antigen-presenting cell. Blocking this inhibitory signal while delivering GM-CSF transduced mammary carcinoma cells led to a more robust antitumor response [37**]. The manipulation of the antigen-presenting environment has thus proved to be an effective means of generating a potent antitumor immune response in otherwise weakly immunogenic models. The collective success of these animal model studies has provided the basis for the development of gene therapy clinical trials using tumor cells transduced with immunostimulatory molecules . These trials will begin to investigate whether these strategies can be successfully translated into the clinical setting. Although the use of cell-based vaccines as described above is advantageous in that it does not depend on defining the relevant tumor rejection antigens, the use of cloned tumor antigens in a vaccine strategy offers some advantages compared with whole cell preparations. Dose of antigen, an important parameter in the induction of an immune response, is more readily controlled with delivery of cloned tumor antigens. Furthermore, there are fewer safety concerns associated with a defined tumor vaccine, because the likelihood of eliciting an immune response to irrelevant proteins is decreased. Genetic modification of the encoded tumor antigen to optimize presentation is also readily accomplished when using cloned tumor antigens . Finally, the use of a defined tumor antigen allows for direct monitoring of both T-cell and humoral immune responses to the antigen of interest. This end point allows valuable information to be gathered from early clinical trials, even if the therapy itself does not result in noticeable effects on tumor burden. Potential targets currently under investigation for vaccination in breast carcinoma include the HER-2/neu protein [3,4,40,41], carcinoembryonic antigen (CEA) , MAGE-1 , and MUC-1 [6,42,43]. These antigens have been pursued on the basis of the high levels of expression in breast tumor tissue compared with normal tissue, as well as an understanding of the epitopes recognized by CTLs. Mutant cellular proteins such as mutant p53 may also provide useful targets for immunotherapy. In addition to these relatively well characterized antigen targets, a number of potential new targets are being studied that may have relevance to breast cancer immunotherapy. One new approach to tumor antigen identification focuses on identifying genes that encode MHC class II-restricted antigens . Initially used to identify a melanoma antigen, this general approach may be applied for the definition of breast TAAs that are recognized by CD4+ cells, expanding the targets for immunotherapy. Another approach seeks to identify TAAs based on a serologic assay rather than T-cell responsiveness. This approach, termed 'serologic identification of antigens by recombinant expression cloning' (SEREX), is based on the observation that cancer patients exhibit circulating antibodies directed towards tumor antigens, and that these antibodies may provide a useful reagent for the identification new tumor antigens [45,46]. Serologic identification of antigens by recombinant expression cloning analysis has greatly expanded the list of potential targets for breast cancer immunotherapy [47*], but whether these antigens will be able to elicit a potent T-cell response remains to be determined. In this regard, simultaneous stimulation of both cellular and humoral immune responses has been demonstrated and is not unexpected, because both rely on helper T-cell function [48*]. The expanding list of antigen targets will be of considerable importance in the development of effective immunotherapies, because each of these antigens is expressed only on a portion of breast tumors. Simultaneous immunization against multiple antigens is likely to be most effective, because it will protect against clonal outgrowth of tumor cells downregulating a single target antigen. A variety of vectors have been employed for transfer of genes that encode tumor antigens or immunostimulatory molecules. These vectors may deliver genes to tumor cells expanded ex vivo for whole cell vaccination, to tumor cells in vivo via direct intratumoral injection, or to muscle or skin for immunization against cloned tumor antigens. Retroviral-mediated gene transfer was the method of choice in most initial studies [49,50]. Although effective in animal models, these viruses are difficult to produce in high titers and are associated with a relatively low level of transduction. Recombinant vaccinia virus is a potent stimulator of cellular and humoral immune response [51,52], suggesting potential of this vector in cancer immunotherapy applications. Immunization of mice with a recombinant vaccinia virus that encoded CEA resulted in a strong cellular and humoral immune response, and the animals exhibited a delayed type hypersensitivity in response to challenge with CEA-expressing tumor cells . Another pox virus vector, the recombinant canarypox virus termed ALVAC, is unable to produce a productive infection in mammalian cells, but can direct high levels of transgene expression, making it a potentially useful vector for immunotherapy . Based on preclinical studies, both recombinant vaccinia and ALVAC vectors are currently under investigation in phase 1 clinical trials for cancer immunotherapy [55,56]. Adenovirus is another viral vector commonly used for gene therapy applications that may be exploited for immunotherapy. This vector is readily prepared in high titers and mediates high levels of transient transgene expression in a variety of cell types. Unfortunately, pre-existing immunity to naturally occurring adenovirus is common, and may compromise the effectiveness of this vector when used for in vivo delivery . To circumvent immune responses to viral vectors and to simplify vaccine production, nucleic acids that encode relevant tumor antigens or immunostimulatory molecules can be delivered by nonviral means. Liposomes may be used for this purpose , but genes may also be delivered 'naked'. The feasibility of such an approach was first recognized when DNA injected intramuscularly was found to be taken up by a small proportion of host cells, in which it may be expressed locally for extended periods of time . In animal models, DNA immunization has been shown to elicit effective antitumor immune responses to CEA and neu [60,61,62]. Interestingly, the properties of plasmid DNA produced in a bacterial system, namely the lack of CpG dinucleotide methylation, acts as an immunostimulant in mammals, enhancing the immune response to the encoded antigen . In addition to plasmid DNA, self-replicating RNA offers a potentially powerful method of antigen delivery [64*,65]. Again, the nucleic acid itself is immunostimulatory. In this case, the double-stranded RNA intermediate generated during the replication process may act as a 'danger' signal, amplifying the immune response. Apoptosis induced by this vector and subsequent uptake of apoptotic cells by DCs probably also contribute to the potent response. In addition to direct intramuscular injection, biolistic delivery of naked DNA or RNA (using the 'gene gun') to the skin offers an alternative method of nonviral gene transfer for immunization . The advantages of this method include the small amounts of nucleic acid needed for delivery, as well as ease of delivery. The disadvantage of this approach has been that this route of delivery favors the development of a T-helper 2, or predominantly antibody response, whereas a T-helper 1, or cellular immune response is preferred for cancer immunotherapy. This unfavorable characteristic may be surmountable by codelivery of cytokines that shift the immune response to a T-helper 1-type response [67*]. In summary, a number of vectors with diverse characteristics are available for gene delivery in the context of genetic immunotherapy. The choice of appropriate vector is dependent on the particular application; however, the vector development field is rapidly evolving. It is likely that refinements in vectors that improve targeting and transgene expression will further the field of genetic immunotherapy. DCs have been recognized as important mediators of immune response. They are specialized antigen-presenting cells that are highly potent in their presentation of antigen to naïve or quiescent CD4+ and CD8+ T cells . They capture, process, and present antigens in combination with MHC class I and II molecules, activating specific CTLs. This ability to stimulate CTLs directly and effectively makes DCs ideal targets to exploit for manipulation of the immune system for cancer immunotherapy purposes. Cell culture techniques have evolved that now permit the in vitro generation of large numbers of DCs from bone marrow or peripheral blood mononuclear cells, making DC vaccination technically feasible. Recently published pilot clinical trials of antigenic protein or peptide-pulsed DCs in non-Hodgkin's lymphoma and melanoma have demonstrated the general safety of this approach, as well as some evidence of antigen-specific immune responses and occasional clinical tumor regressions [69,70]. A controlled study  in which healthy individuals were injected subcutaneously with autologous monocyte-derived DCs pulsed with keyhole limpet haemocyanin (KLH), tetanus toxoid, or an HLA-A2-restricted influenza matrix peptide demonstrated priming of CD4+ T cells to KLH, boosting of tetanus toxoid-specific T-cell immunity, and increases in influenza peptide-specific CD8+ T, respectively, whereas injection of antigens alone failed to immunize control individuals. Although these findings are preliminary, they suggest the potential for DC-mediated vaccination strategies. In addition to peptide or protein pulsing into DCs, several studies have focused on delivering genes that encode tumor antigens to the DCs. One advantage offered by this approach is enhanced efficiency of MHC peptide loading compared with pulsing of DCs with intact protein. Furthermore, compared with peptide pulsing, transfer of the antigen-encoding gene and intracellular synthesis of the complete protein allows the host to select antigenic epitopes from the entire protein, rather than being restricted to a single epitope. Several promising gene transfer approaches exist that have been used to transduce DCs ex vivo and promote therapeutic tumor immunity in model systems. These include retroviral, poxvirus, and adenoviral vectors, a targeted adenoviral vector, as well as naked RNA [72,73,74,75,76,77*,78]. The prospects for successful immunotherapy of cancer have improved based on insights from a wide range of fields related to tumor immunology. Appreciation of the basis of poor immunogenicity of tumor cells, cloning and functional analysis of cytokines, and recognition of the critical cells and costimulatory molecules that are involved in immune recognition have facilitated the development of rational strategies to stimulate antitumor immune responses. In the coming years, the development of advanced generation gene transfer vectors should enhance our ability to target appropriate cells specifically and to achieve optimal transgene expression, and definition of breast tumor antigens will expand the targets for immunotherapy. These new developments will be brought to bear on the design of clinical trials of novel immunotherapies. Evaluation of these new genetic immunotherapy strategies in clinical trials that employ careful immune response analysis studies should guide further development in the field, allowing it to reach its full potential and offering new hope to those with breast cancer. The microenvironment is critical to the stimulation of aneffective T-cell-mediated antitumor immune response. Presentation of the antigen ( ) to T cells by antigen-presenting cells (APCs) must include theengagement of costimulatory molecules such as B7 (▼) on the APC with CD28(Y) on the T cell. Detection of antigen in the absence of this signalcan result in tolerance. 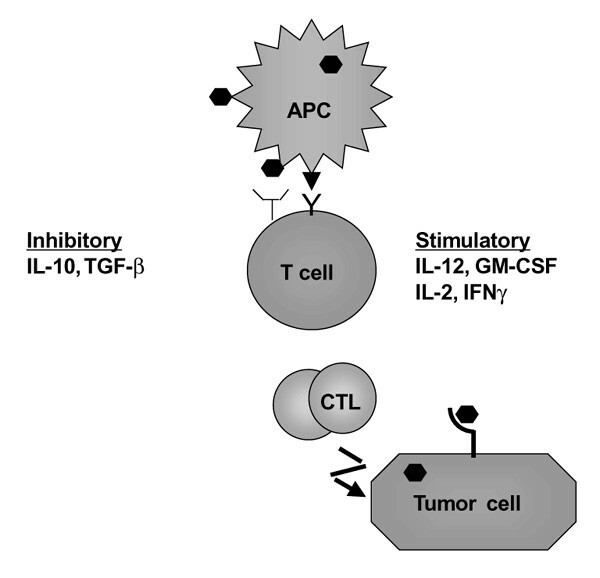 Release of cytokines including interleukin (IL)-12,granulocyte-macrophage colony-stimulating factor (GM-CSF) (by APCs), IL-2 andinterferon (IFN)γ (by T cells) stimulate a strong cellular immuneresponse, whereas local production of IL-10 or transforming growth factor(TGF)-β blunts T cell responsiveness. Finally, for cytotoxic T lymphocytes(CTLs) to be able to recognize their targets, the tumor cells have functionalmajor histocompatibility complex class I tumor antigen presentation ).